Yin Xu (Chinese: 殷墟; pinyin: Yīnxū; literally "Ruins of Yin") is the ruins of the last capital of China's Shang Dynasty (1600 B.C.E.-1046 B.C.E. ), also known as the Yin dynasty. It is located in the central Henan province, near the modern city of Anyang. King Pangeng established Yin on the Huan River during the fourteenth century B.C.E. From the capital, twelve kings in eight generations took the Shang dynasty to its peak before its fall to the Zhōu (周) dynasty in 1046 B.C.E. From that time, Yin had been abandoned and lost until the end of the nineteenth century. Rediscovered in 1899, Yin Xu numbers among the oldest and largest archaeological sites in China. The site became famous as the original source of oracle bones and oracle bone script, the earliest recorded form of Chinese writing. Wang Yirong, director of the Imperial College, discovered the first oracle bones, leading to the discovery China's earliest ideograms. In the process, he verified the authenticity of the Shang dynasty. In 1929, the first excavations of Yin Xu began, leading to the unearthing of a palace, tombs, and 100,000 oracle bones. The ongoing excavations since 1950 set the standard for archeology throughout China. Eighty sites confirm Yin Xu as the spiritual and cultural center of the Yin Dynasty. The Tomb of Fu Hao and the Exhibition Hall of Chariot Pits stand out among the excavation sites. The People's Republic of China declared Yin Xu one of the Historical capitals of China in 1988, while UNESCO designated it a World Heritage Site in 2006. 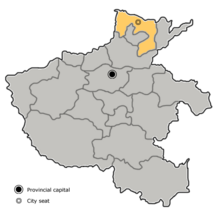 Yin Xu is located near Anyang in Henan province, People's Republic of China. At the beginning of the fourteenth century B.C.E. King Pangeng of the Shang Dynasty established his capital on the banks of the Huan River. The city, known as Yin, also gave it's name to the dynasty of that time, the Yin Dynasty. King Wu Ding continued to use Yin as his capital, from that base launching numerous military campaigns against surrounding tribes securing Shang rule. Fu Hao, his wife, led many of the campaigns. King Wu Ding and Fu Hao took the dynasty to its zenith. Later rulers, pleasure-seekers, took little interest in state affairs. Internal strife escalated as social differences within the slave-owning society increased. King Zhòu (紂), the last of the Shang Dynasty kings, especially earned a reputation as a ruthless and debauched ruler. His increasingly autocratic laws alienated the nobility until King Wu of the Zhōu Dynasty (周) overthrew the Shang dynasty with popular support from the people. The Zhōu (周) established their capital in Feng and Hao near modern day Xi'an, Yin abandoned to fall into ruin. Sima Qian, in his Records of the Grand Historian, mentioned those ruins, but soon they were lost and their location forgotten. The once-great city of Yin had been relegated to legend along with the dynasty that founded it. Yinxu won renown for the oracle bones, discovered in 1899 by Wang Yirong, director of the Imperial College. Director Wang, suffering from malaria at the time, had been prescribed Longgu (dragon bones) at a traditional Chinese pharmacy. He noticed strange carvings on those bones and concluded that they could have been some of China’s earliest ideograms. Sending his assistant in search of the source of those bones, he traced to the small village of Xiaotun just outside of Anyang. In 1917, Wang Guowei deciphered the oracle bone inscriptions, identifying the names of the Shang kings and constructing a complete Shang genealogy. That decipher perfectly matched those in the Records of the Grand Historian by Sima Qian, confirming the historical authenticity of the legendary Shang Dynasty and the archaeological importance of Yinxu. Li Chi of the Institute of History and Philosophy from 1928-1937 led the first excavations at Yinxu. They uncovered the remains of a royal palace, several royal tombs, and more than 100,000 oracle bones that showed the Shang had a well-structured script with a complete system of written signs. Since 1950, ongoing excavations by the Archaeological Institute of the Chinese Social Sciences Academy have uncovered evidence of stratification at the Hougang site, remains of palaces and temples, royal cemeteries, oracle bone inscriptions, bronze and bone workshops and the discovery of the Shang city on the north bank of the Huang River. One of the largest and oldest sites of Chinese archaeology, excavations in Yin Xu laid the foundation for work across the country. At 30 square kilometers (12 sq mi), Yin Xu measures as the largest archaeological site in China and excavations have uncovered over eighty rammed-earth foundation sites including palaces, shrines, tombs and workshops. From those remains, archaeologists have confirmed that Yin Xu served as the spiritual and cultural center of the Yin Dynasty. Chariots of the Shang dynasty excavated in Yin Xu represent the earliest example of animal-drawn carts discovered in China. The Tomb of Fu Hao stands out as the best preserved of the Shang Dynasty royal tombs unearthed at Yinxu. The extraordinary Lady Hao had been a military leader and the wife of Shang King Wu Ding. Discovered in 1976, the tomb has been dated to 1250 B.C.E. Completely undisturbed, the tomb escaped the looting that had damaged the other tombs on the site. In addition to the remains of the Queen, six dog skeletons, sixteen human slave skeletons, and numerous grave goods of huge archaeological value had also been discovered in the tomb. Thoroughly excavated and extensively restored, Fu Hao's tomb has been opened for public viewing. The Exhibition Hall of Chariot Pits, also located on site, displays the earliest animal-driven carts discovered by Chinese archaeologists. The Anyang Working Station of the Archaeological Institute of the Chinese Social Science Academy and the Historical Relics Working Team of Anyang Municipality excavated those artifacts. They unearthed them in the northern and southern lands of Liujiazhuang village and the eastern land of Xiaomintun village, putting on the artifacts display within the hall. The six pits each contain the remains of a carriage and two horses. Five of the pits contained the remains of a human sacrifice (four adult males and one child). The remains of an 8.35 meters (27.4 ft) wide Shang Dynasty road discovered at Anyang Aero Sports School in 2000. In 1988, Yinxu became the oldest of the seven Historical capitals of China while in 2006 UNESCO designated Yin Xu a World Heritage Site. The oracle bone pit no. yh127 has been called as "the earliest archive of oracle inscriptions of China." ↑ Shouyi Bai, An Outline History of China (Beijing: Foreign Language Press, 2002). ↑ Qian Sima and Burton Watson, Records of the Grand Historian. Qin Dynasty (Hong Kong: Renditions-Columbia University Press, 1993). ↑ Linfu Dong, Cross Culture and Faith: The Life and Work of James Mellon Menzies (Toronto: Univ. of Toronto Press, 2005), 272. ↑ 4.0 4.1 CCTV, An Yang, ancient capital of the Shang Dynasty. Retrieved November 30, 2008. ↑ Kwang-chih Chang, Pingfang Xu, Liancheng Lu, and Sarah Allan, The Formation of Chinese civilization: an archaeological perspective. The culture & civilization of China (New Haven, CN: Yale University Press, 2003), 4. ↑ Bruce G. Trigger, A History of Archaeological Thought (Cambridge: Cambridge University Press, 2006), 265. ↑ Lamberg Karlovsky, Clifford Charles, and Jeremy Arac Sabloff, The Rise and Fall of Civilizations: Modern Archaeological Approaches to Ancient Cultures; Selected Readings (Menlo Park, Calif: Cummings, 1974), 449. ↑ Li Liu, The Chinese Neolithic Trajectories to Early States (Cambridge, UK: Cambridge University Press, 2004), 6. ↑ William Watson, The Arts of China (New Haven: Yale University Press, 1995), 11. ↑ Donald B. Wagner, Iron and Steel in Ancient China (Leiden, Netherlands: E.J. Brill, 1993), 519. ↑ Peter Hessler, Oracle Bones: A Journey Between China's Past and Present (New York: HarperCollins, 2006), 3. ↑ UNESCO, Yin Xu. Retrieved November 30, 2008. Bai, Shouyi, and Zhao Yang. 2002. An Outline History of China. Beijing: Foreign Languages Press. ISBN 9787119023472. Chang, Kwang-chih, Pingfang Xu, Liancheng Lu, and Sarah Allan. 2003. The Formation of Chinese Civilization: An Archaeological Perspective. New Haven, CN: Yale University Press. ISBN 9780300093827. Dong, Linfu. 2005. Cross Culture and Faith: The Life and Work of James Mellon Menzies. Toronto: Univ. of Toronto Press. ISBN 9780802038692. Hessler, Peter. 2006. Oracle Bones: A Journey Between China's Past and Present. New York: HarperCollins. ISBN 9780060826581. Liu, Li. 2004. The Chinese Neolithic Trajectories to Early States. Cambridge, UK: Cambridge University Press. ISBN 9780511080562. Trigger, Bruce G. 2006. A History of Archaeological Thought. Cambridge: Cambridge University Press. ISBN 9780521840767. Sima, Qian, and Burton Watson. 1993. Records of the Grand Historian. Qin dynasty. Hong Kong: Renditions-Columbia University Press. ISBN 9780231081641. Wagner, Donald B. 1993. Iron and Steel in Ancient China. Handbuch der Orientalistik, 9. Bd. Leiden, Netherlands: E.J. Brill. ISBN 9789004096325. Watson, William. 1995. The Arts of China. New Haven: Yale University Press. ISBN 9780300059892. This page was last modified on 29 July 2013, at 14:24.